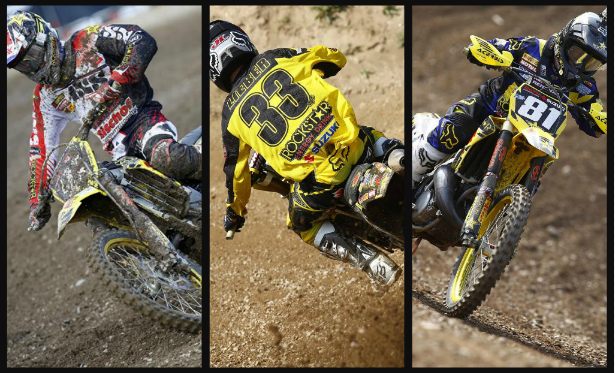 Team Suzuki Press Office – July 27. Rockstar Energy Suzuki’s Brian Hsu grabbed the EMX125 Red Plate after taking his third consecutive win today at Loket in the Czech Republic, as Jeremy Seewer and Julien Lieber broke into the top-10 in the MX2 class with eighth and ninth positions. Some 21,500 spectators travelled to the Loket circuit for the Grand Prix of Czech Republic and the 14th round of 17 in the FIM MX2 World Championship. The fixture was owned by Jordi Tixier in the absence of series leader Jeffrey Herlings but Seewer made a decent showing around the narrow curves and hilly sections of the ‘old-school’ layout. But also shining at the circuit located near the spa town of Karlovy Vary was Hsu: The teenager guided his RM125 to a third consecutive win in the penultimate round of the European EMX125 campaign and now fronts the standings by 12 points with a real chance of the title next weekend in Belgium. Loket was fast, slick and largely flat. It was challenging in several regards – the slim layout meant overtaking was tricky – but the course was also simplistic. Hsu scooped victories in both motos, one on Saturday and the other on Sunday, and took a massive step towards the 2014 crown. The second race saw the youngster enjoying and close dice with Sweden’s Alvin Ostlund. Hsu now needs to keep a watch on Holland’s Davy Pootjes at the final meeting of EMX125 and try to outpoint his principal rival. Seewer equalled his second-best result of his rookie season in MX2 by setting a mean pace in the opening moto of the day on the works RM-Z250. The Swiss slid though to sixth position and then batted away the attentions of Christophe Charlier from the third lap until the last. The ‘#91’ tried to instil the same confidence in his second moto run of 30 minutes and two laps duration. The speed and urgency was there but a poor start and mistake that saw him exit the track was costly in terms of positions and he had to work hard to rise to 11th place to be eighth overall. Lieber was frustrated by his day. An early crash in the first moto meant he could do no better than ninth position and a drop in form in the second race saw the Belgian unsatisfied with 10th spot. Events in the Czech Republic now mean that Seewer and Lieber are 10th and 11th in the MX2 Championship standings. Rockstar Energy Suzuki Europe will now look ahead to the Grand Prix of Belgium in the energy-sapping sand of Lommel next weekend.